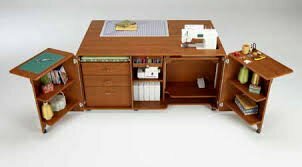 The Koala Artisan Studio is thoughtfully constructed with 15% more surface area and 25% more storage space than standard 70” Koala Studio models to accommodate the largest sewing and embroidery machines, and all the ambitious projects you make with them. The pullout Embroidery Module and Embroidery Hoop Storage Closets are specifically designed for most Baby Lock and Brother machines, and an XL Lift – standard with the Artisan – raises and lowers even the heaviest machine smoothly and safely. Features include three extra-deep, full extension, soft-closing drawers.